So on the weekend, my friends Henna & Moz (obvs not real birth names) were having a birthday party which was a greek themed toga party. I digress. But that was an awesome pun right? Anyway. To Toga! For me, Grecian fancy dress is about three things. 1) A decent bed sheet which covers necessary bits. 3) Chiselled cheekbones to rival the statue of Zeus. Okay okay, I totally cheated on number 1 – I just happen to have a cream maxi which hasn’t been worn since last summer. Cheat cheat cheat cheat cheat, thats me. Soz. 2 & 3 however, are very easily done and I’m going to show you how! I used Seventeen CC Cream for a natural-looking matte radiance, set with a touch of Urban Decay Razor Sharp finishing powder. On the cheeks, I’ve used ELF Contouring Blush & Bronzing Powder Duo in Turks & Caicos (the blush is a fab duplicate for Benefit Dallas!). Really similar to the Elf Blush & Bronzer cream I reviewed earlier this week but in powder form. 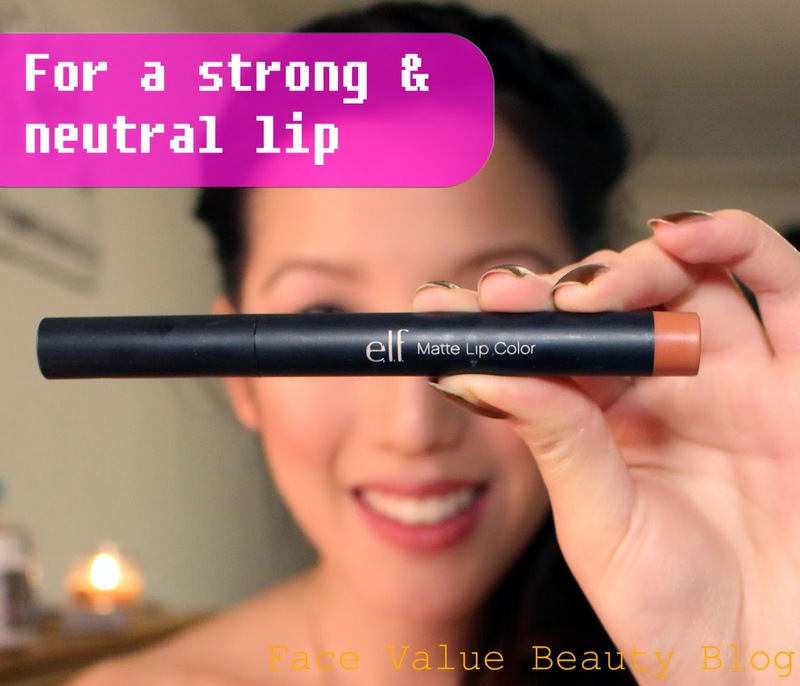 The lips needed to be defined but still neutral – so I went with ELF Studio Matte Lip Colour in Praline. A nice taupe/mauve colour which looks elegant yet not too overdone. Now – onto the hair!!! This is what I like to call my fake-but-real high ponytail. 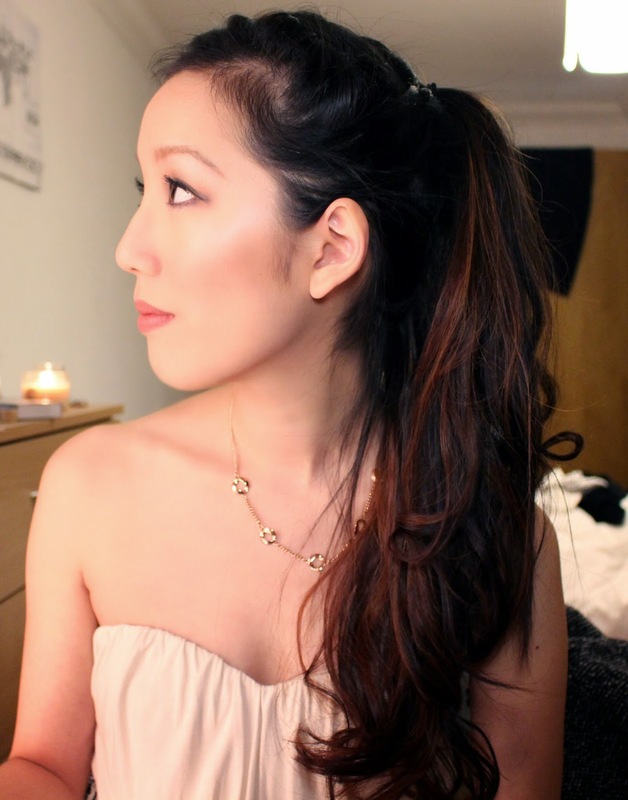 Inspired by Ariana Grande (who is my absolute hair icon on the moment) and her ever-flowing, ever-going high pony. Most of the time Ariana’s hair is just half up but that’s when I realised it’s all about the illusion of one ponytail. I’m also pretty sure that Ariana Grande’s hair is mainly extensions but I worked out a way of creating a longer ponytail WITHOUT the need for extensions. Enter unattractive side-angle but look at the length on that!! ….. I’ve actually only put up half of my hair, and the rest is just chilling on my shoulders. The bits in pink are the top ponytail, the rest is just loose. Shh! The final step is to pick up one of the strands and wind it around under the loose hair and tuck it into the ponytail so you get a pretend lift at the neck – almost like a real ponytail! For the ultimate grecian look, I’ve even added a plait along the top. Just like a french plait, but start at one ear and work up and over to the other. Once you get to the other ear, secure it into the top half-ponytail! And finally – secure your style with some strong hairspray. 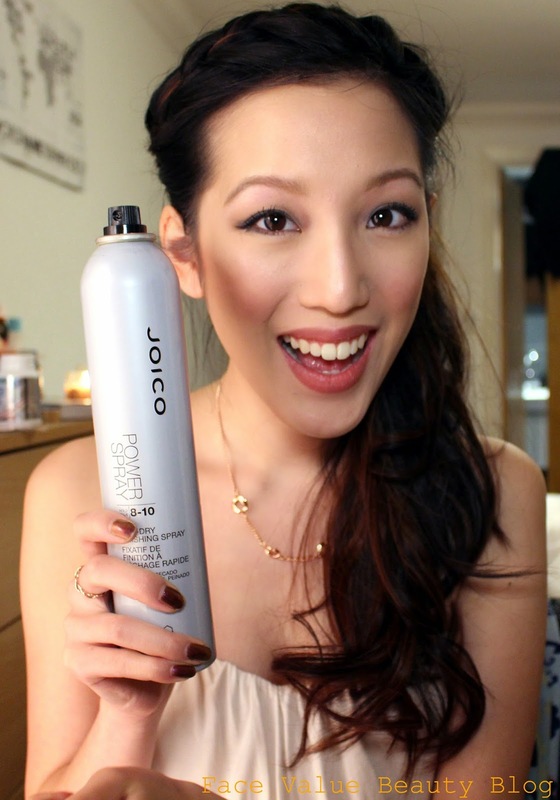 This Joico Power Spray is THE best strong hairspray I’ve ever used. Its got a hold of 8-10 (out of 10) and freezes hair in place within seconds. I really really really recommend PowerSpray for those who are looking for a heavy-duty hairspray which holds! 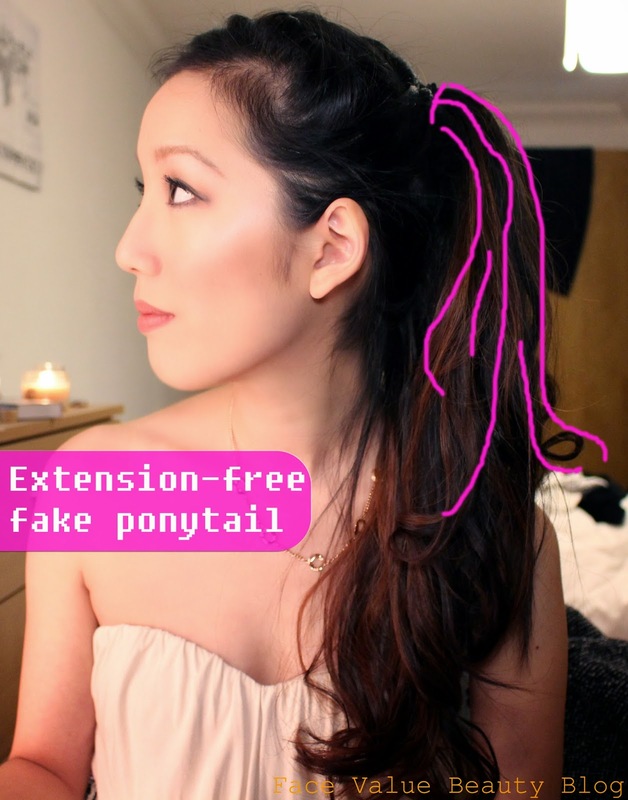 What do you think about my Face Value fake-but-real ponytail? Gotta work on the name right..? Previous Post #MoneyMonday: How Many Bank Accounts Should I Have?